White Conveyors, Inc., the recognized Worldwide Leader of Automated Garment Sorting, Storage and Retrieval Systems, held a week long sales conference in October at their headquarters located in Kenilworth, New Jersey. The twelve member international team included members of Speed Check Conveyor, a member of the White Conveyors family. The group gathered in preparation of the upcoming launch of new systems, products and upgrades. The team was presented with new product initiatives and strategic objectives for the upcoming year. Highlights included major enhancements to the U-Pick-It, the hospitality market’s leading Automated System for Uniforms and Locker Bags. In addition, White announced the introduction of the new AUS, which incorporates all of the benefits and reliability of White’s larger U-Pick-It, designed to provide affordable uniform room automation for properties with up to 500 team members (uniform exchange only). For the Dry Cleaning market, White announced the improved SUV-OAS Automated Order Assembly System. The SUV-OAS is designed to help dry cleaners expand their business, reduce costs, improve customer service and increase profits. 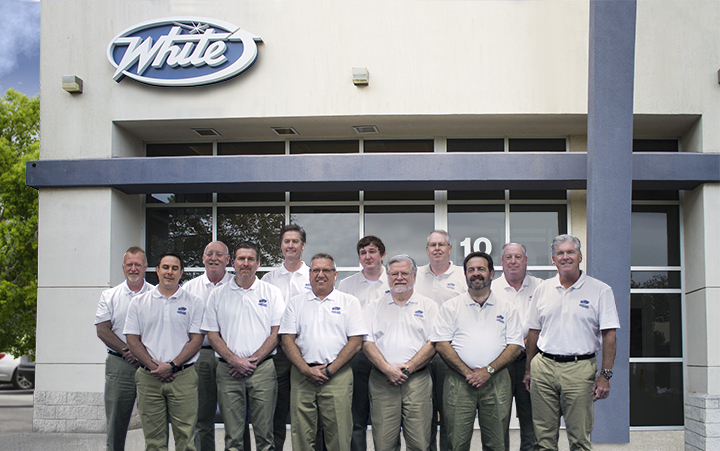 White’s sales team covers the globe, providing local representation for its national and international customers and potential customers worldwide. They also provide training and support services in their territories. White’s customers are provided personal service while developing the most cost effective systems and solutions. Since its founding in 1944, White Conveyors has installed over 100,000 conveyors in the United States and throughout the world.